Anatomical abnormalities of the cervical spine at the level of the Atlas vertebra are associated with relative ischaemia of the brainstem circulation and increased blood pressure (BP). Manual correction of this mal-alignment has been associated with reduced arterial pressure. This pilot study tests the hypothesis that correcting mal-alignment of the Atlas vertebra reduces and maintains a lower BP. Using a double blind, placebo-controlled design at a single center, 50 drug naive (n=26) or washed out (n=24) patients with Stage 1 hypertension were randomized to receive a National Upper Cervical Chiropractic (NUCCA) procedure or a sham procedure. Patients received no antihypertensive meds during the 8-week study duration. The primary end point was changed in systolic and diastolic BP comparing baseline and week 8, with a 90% power to detect an 8/5 mm Hg difference at week 8 over the placebo group. The study cohort had a mean age 52.7+/-9.6 years, consisted of 70% males. At week 8, there were differences in systolic BP (-17+/-9 mm Hg, NUCCA versus -3+/-11 mm Hg, placebo; P<0.0001) and diastolic BP (-10+/-11 mm Hg, NUCCA versus -2+/-7 mm Hg; P=0.002). Lateral displacement of Atlas vertebra (1.0, baseline versus 0.04 degrees week 8, NUCCA versus 0.6, baseline versus 0.5 degrees , placebo; P=0.002). Heart rate was not reduced in the NUCCA group (-0.3 beats per minute, NUCCA, versus 0.5 beats per minute, placebo). No adverse effects were recorded. We conclude that restoration of Atlas alignment is associated with marked and sustained reductions in BP similar to the use of two-drug combination therapy. It is well known that achievement of blood pressure (BP) goals in more than 70% of hypertensive individuals requires two or more antihypertensive agents. Based on the most recent NHANES 1999–2000 data, BP control in the US has not improved significantly. Moreover, many people have searched for alternative methods for lowering arterial pressure. Since the early 1940s, a small cadre of chiropractic specialists have foregone typical ‘full-spine manipulations’, limiting their practice to precise, delicate manual alignment of a single vertebra, C-1 or Atlas; these practitioners make up the National Upper-Cervical Chiropractic Association (NUCCA). Unlike other vertebrae, which interlock one to the next, the Atlas relies solely upon soft tissue (muscles and ligaments) to maintain alignment; therefore, the Atlas is uniquely vulnerable to displacement. Displacement of C-1 is pain free and thus, remains undiagnosed and untreated, whereas health-related consequences are attributed to other aetiologies. Minor misalignment of the Atlas vertebra can potentially injure, impair, compress and/or compromise brainstem neural pathways. The relationship between hypertension and presence of circulatory abnormalities in the area around the Atlas vertebra and posterior fossa of the brain has been known for more than 40 years. [3-5] Studies by Jannetta et al. note arterial compression of the left lateral medulla oblongata by looping arteries of the base of the brain in 51 of 53 hypertensive patients who underwent left retromastoid craniectomy and microvascular decompression for unrelated cranial nerve dysfunctions. Such compression was not present in normotensive patients. Treatment by vascular decompression of the medulla was performed in 42 of the 53 patients and amelioration of hypertension was noted in 76%. Moreover, studies to clarify the mechanism by which decompression of the left rostral ventrolateral medulla relieves neurogenic hypertension are summarized in a review. It is clear from these studies that a sub-population of hypertensive patients improved their BP after microvascular decompression. Changes in the anatomical position of the Atlas vertebra and resultant changes in the circulation of the vertebral artery lend itself to worsening of hypertension. Recent studies by Akimura et al. using magnetic resonance (MR) imaging examined hypertensive patients and compared them to controls, evaluating the relationships between the upper ventrolateral medulla and vertebral arteries and branches. They noted compression in 90.6% of 32 hypertensive cases, this was in contrast to controls and those with secondary hypertension who failed to demonstrate a significant incidence of compression. Furthermore, two other studies using MR imaging techniques also demonstrated a significant association between compression of the vertebral artery and changes in the posterior fossa of hypertensive but not normotensive individuals. [9, 10] Thus, alterations in Atlas anatomy can generate changes in the vertebral circulation that may be associated with elevated levels of BP. This pilot study examines the relationship between nonsurgical interventions to align the Atlas vertebra and long-term changes in BP and heart rate. The criteria used in this study to establish efficacy of an antihypertensive effect are those defined by the Food and Drug Administration for approval of a new antihypertensive drug. Specifically, it would require a blinded design with a placebo-subtracted reduction in diastolic BP of 5mm Hg or more and be free of serious side effects to be approvable. The study design used was randomized, double blind, with a placebo control. Patients were randomized using a list of randomization numbers and treatment assignments for each of the patients at one site. The trial was conducted in accordance with the Good Clinical Practice/International Conference on Harmonization guidelines, with mandatory signed informed consent for study participation and approval by the Western Institutional Review Board. All patients were computer randomized into Treatment and Control Groups and were washed out of their current BP medications for 2 weeks. Patients whose BP exceeded 159/99 mm Hg on two separate visits during this time were excluded from the study. A summary of the recruitment and randomization of patients is noted in Figure 1. (d) capacity/willingness to execute Informed Consent documents. (m) had unwillingness/incapacity to execute Informed Consent documents and/or to comply with patient-pool requirements for screening-period/study duration. The primary end point in this study, change in BP from baseline, was determined from a mean of three sitting cuff BP measurements with an appropriate sized cuff as outlined by the American Heart Association guidelines and described in the Joint National Committee Report (JNC 7).1 If at any time during the study, BP was >159/99 mm Hg on two consecutive visits 1–3 days apart, the investigator was to consider withdrawing the patient from the study. Duration of the study was 8 weeks. Visits were scheduled every week up to the 8th week. At each visit, patients were assessed for vital signs, and adverse events. (c) postural analysis: NUCCA developed proprietary assessment device, known as 'Anatometer', (Benesh Corp., Monroe, MI, USA) to provide pertinent diagnostic details of postural asymmetries. It features Left and Right weight-bearing scales and other calibration mechanisms designed to provide clinical measures of Atlas misalignment. (iv) weight-bearing inequalities, left versus right, as calibrated by a pair of weight-sensitive platforms (electronic scales) coupled to transducers, with values reported in digital read-outs, of the portion of total body weight supported by each foot. (iii) Vertex: through the crown of the skull and into the neural canal. These data were then used to determine procedure planning. Specifically, the postural assessment protocols (supine leg-length checks, paracervical skin-temps and Anatometer readings), and measurements from the three craniocervical X-ray views were reviewed. Film diagnosis is conducted as follows: the clinician locates physiological landmarks to mark pencil lines at 'vertical axis' (perfect Atlas alignment) and the center of the skull on the Nasium view, then uses a protractor to measure physiologic angles that deviate from them, view by view, in order to visualize, in three dimensions, the Atlas misalignment's degree and orientation. Based on those findings (measured in degrees), the principles of biomechanics, and his/her own experience, the clinician plans the proper stance, force vector and 'physiologic geometry' for the subtle intervention. All of these measurements were carried out at baseline and repeated after the procedure during the first visit and again at 8 weeks. It should be noted that this technique requires special training and is used only by NUCCA practitioners. It has some variability, as it is operator dependant like most surgical techniques. Treatment group The patient is positioned on a low (8-inch) side-posture table, depending on misalignment's orientation), with head precisely placed on a curved, mastoid support, which serves as the intervention's 'fulcrum'. Several measurements inform clinician's optimum body stance and vectors relative to the patient. For precision, support and control, the clinician firmly clasps the non-dominant hand around the dominant wrist, and then precisely positions the dominant hand's pisiform on the appropriate 'corner' of the Atlas transverse process, to use it as the intervention's 'adjustment lever'. A series of precise, subtle, external nudges causes Atlas to recoil into normalized alignment, reseating occipital condyles into Atlas' lateral masses. Control group The sham intervention was designed to be indistinguishable to the patient from an authentic alignment, possible only because of the delicacy of the procedure. This group's intervention was identical to that employed for the Treatment Group except the clinician intentionally and slightly misplaced the patient's head on the ('fulcrum') support device and misplaced his hands, intentionally to miss the Atlas' lateral-mass contact point for the crucial 'lever nudge'. After the treatment or sham procedure was performed, there were repeated measurements of all of the aforementioned variables. To preserve the study blind, sham 'realignments' and assessment protocols were scheduled for members of the control group. Eighty-five percent of treatment group required only one intervention (remained 'in Atlas alignment') during visits over the two month course of the trial. Pre-and post-adjustment measures of both lateral and rotational orientation of the Atlas were performed at baseline. In addition it is assessed if the treatment was persistent and whether there is a significant difference between treatment and control groups at baseline, after baseline adjustment and at 8 weeks. The critical factor in each case was not the direction of Atlas orientation but rather its magnitude (absolute value), as this indicated how far the C1 vertebra was from its desired anatomical position. The study was designed to have 90% power for detecting a difference of 10 mm Hg in systolic blood pressure (SBP) change between the treatment and control groups with 25 patients per group, anticipating a 10% dropout rate. Demographic and baseline characteristics were compared using t-tests, Pearson's chi2 tests and Fisher Exact tests as appropriate. 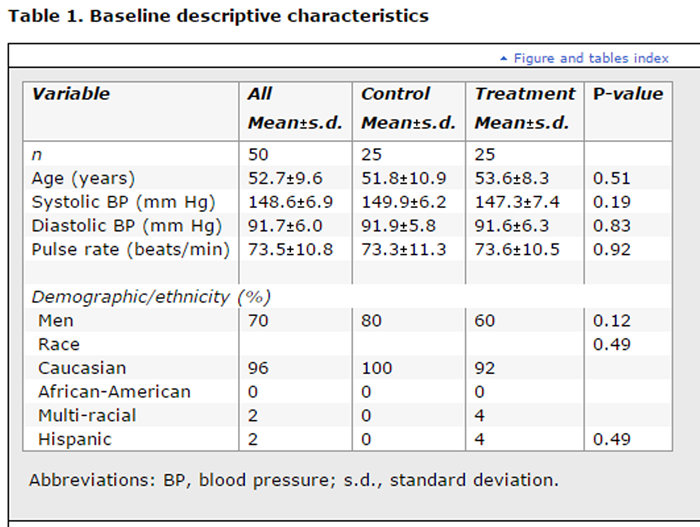 The primary analyses used t-tests to compare the change in BP from baseline to week 8 between the two groups. The one dropout was excluded from the control group. As the drop in BP at week 4 for that patient was less than the mean drop in the control group. Excluding that patient's results was conservative. Secondary analyses used analysis of covariance to adjust for baseline level, and to estimate the treatment difference. All tests were two-sided and P-values less than 0.05 were considered significant. Paired t-tests were used to determine if change from baseline to 8 weeks was significant within groups. 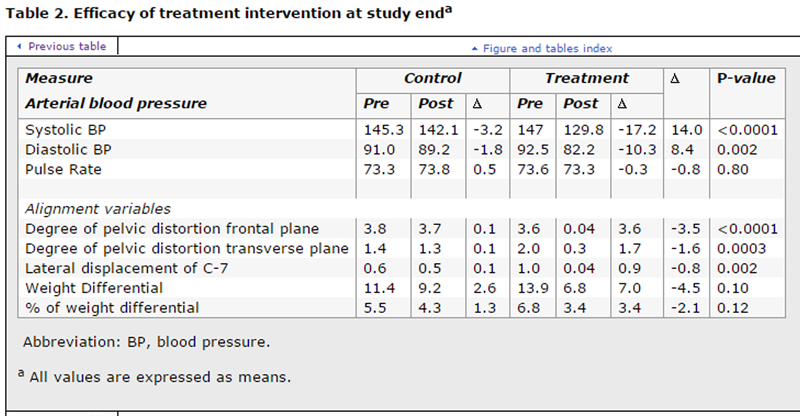 We compared pre- to post-adjustment values at baseline within each group to ensure that treatment had been effective in the treatment group and that no significant difference in condition occurred in the control group. We also compared post-adjustment at baseline to the 8-week measure. Baseline comparisons in the control group were important both in terms of establishing no treatment effect as well as in terms of verifying that no harm was done by the sham adjustment. Comparisons of baseline to 8 weeks were important in the treatment group to verify persistence, whereas they were important in the control group to ensure no spontaneous adjustment might explain a potential lack of difference in the two groups. The hypothesis behind the Atlas adjustment suggests that misalignment involves either a displacement from an optimally centred location or a rotation away from an optimally angular orientation (as determined by X-ray). For this reason, we examined absolute values of the rotational and angular components rather than the signed values. Fifty patients were screened and enroled into the washout period from one clinic between September 2004 and February 2005. All 50 patients were then randomized and completed the study. The demographic and baseline characteristics of the randomized cohort are shown in Table 1. No differences were noted between groups. The primary efficacy analysis included all 50 participants who had BP, pulse rate and Atlas measurements performed, Table 2. This relationship also held when the changes in treatment effect were adjusted for baseline SBP (-13.2plusminus2.9 mm Hg; P<0.0001) and diastolic blood pressure (-7.6plusminus2.3 mm Hg; P=0.002). All the results are summarized in Table 2. A summary of the X-ray changes both pre- and post-procedure throughout the study is noted in Table 3. It is noteworthy that the difference in both rotational and lateral positioning persisted for 8 weeks, as did the reduction in BP, Table 3. Given that most single agent antihypertensive agents yield an 8 mm Hg drop in pressure in people with Stage 1 hypertension, an analysis was performed to evaluate the percentage of people with greater than this effect in the two groups (36% control versus 88%, NUCCA; P=0.0002). There were no adverse effects to report during this short-term study. The findings of this pilot study represent the first demonstration of a sustained BP lowering effect associated with a procedure to correct the alignment of the Atlas vertebra. The improvement in BP following the correction of Atlas misalignment is similar to that seen by giving two different antihypertensive agents simultaneously. [11, 12] Moreover, this reduction in BP persisted at 8 weeks and was not associated with pain or pain relief or any other symptom that could be associated with a rise in BP. (a) how does misalignment of C1 affect hypertension? (b) If there is a cause and effect relationship between C1 misalignment and hypertension is malposition of C1 an additional risk factor for the development of hypertension? What is clear is that misalignment of the Atlas vertebra can be determined by assessment of the alignment of the pelvic crests. This should be considered in those who have a history of hypertension and require multiple medications for treatment. Additionally, it should be considered in those with refractory hypertension and a history of neck injuries, independent of the presence of pain. Note that pain was not present in any of the patients randomized in this study. As discussed in the Methods section of this paper, techniques are now available to screen for atlas misalignment. This type of screening should be the responsibility of the primary care physician and should be performed on patients who have a history of head and neck trauma even if it is deemed insignificant. Those patients who present with pain related to head and neck trauma should not be screened. At a time when the prevalence of hypertension is increasing and its control more difficult due to a variety of factors, linking the correction of C1 misalignment to the subsequent lowering of BP may represent an important advancement in the screening of such patients. This pilot study has limitations including the fact that it was dependent on the skill of one practitioner to do the manipulation. It was designed, however, to test the concept that nonsurgical manipulation can alleviate elevations in BP, thus it cannot be generalized until confirmed in a larger trial, which is being planned.